With the Nintendo 3DS's recent price drop I got my hands on the handheld and a copy of The Legend of Zelda Ocarina of Time 3D. Is this a blast from the past, or does this fairy boy need to grow up and move on? Find out in the Gouki.com Review. Remember the days of playing on your Nintendo 64 and getting Ocarina of Time for the first time? How hooked into the game you became, and how engaged into the story you were? Well fast forward 13 years to 2011 and having that same feeling hit you again. That’s right Jimmy’s Legend of Zelda Ocarina of Time has returned in glorious 3D on the Nintendo 3DS. Is this remake of a classic worth your money, or should this game just remain a memory. Find out in the Gouki.com Review. The story in Legend of Zelda Ocarina of Time follows a young boy named Link (or whatever you want his name to be) through an epic quest involving fairies, sages, ocarinas, magic, and time travel. An evil man by the name of Ganondorf comes from the Gerudo Valley to the land of Hyrule to take over as king of the land. Link’s quest is to collect 3 spiritual stones and seek the princess of Hyrule. He finds out that he must obtain the Master Sword to stop the evil Ganondorf, but is too young to fulfill his quest. He then spends 7 years in a mystical place only to return to Hyrule and see it completely destroyed. Link then with the help of Sheik saves 6 sages and does battle with Ganondorf. Now most people have already played through Ocarina of Time numerous times and know the story well. In Ocarina of Time 3D everything is just as you remember it. 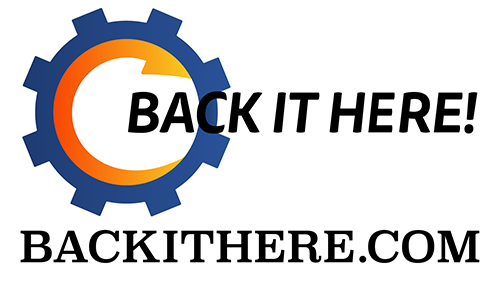 Everything has been left intact story wise and you’ll feel right at home in this version too. The 3DS isn’t exactly the same as a N64 controller or a GameCube controller, but Ocarina of Time 3D does a great job with the systems control. 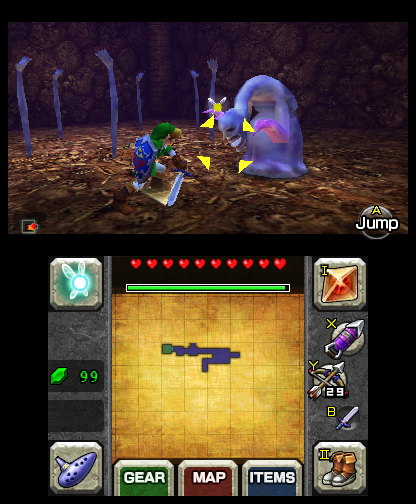 The game uses the bottom touch screen for inventory management, map, and ocarina. This is the first time that you can hold 4 items plus the ocarina at the same time, instead of the usually 3 or 2 with ocarina. This comes in handy in the later stages when you need to change boots or use the lenses of truth on the fly. The controls take a few minutes to get used to, but you’ll get the hang of it in no time and be plugging away at the game just like before. As like before there is horse riding, sword slashing and Ocarina playing plus a bunch of puzzles to solve. This version also comes with Ocarina of Time Master Quest, which is a harder version of the game with new dungeon layouts. You basically get two games in one! Overall the gameplay and controls are quite impressive. The look of Ocarina of Time is believe it or not better than its N64 and GameCube predecessor. The visual improvements are immediately apparent. The characters look more rounded out and less boxy than before. Link both young and old look different, in a good way. The 3D aspect also adds a nice touch to the games visuals. The entire game can be played in 3D and still be enjoyed, but I recommend only using the 3D during cut scenes. There are also other visual changes that have been added to this version of the game, such as with the bridge to the castle in the future looks like an actual golden bridge instead of a rainbow walkway. Bottom line is that the visual aspect of the game has been improved all around. One of the best things about Zelda games is the music. Koji Kondo’s original soundtrack hasn’t been messed with here in Ocarina of Time. From the classic Kakariko Village theme, to the Lost Woods, or the Gerudo Valley (I could listen to these all day) everything is represented just as you remember it. Link’s grunts and screams, the Ocarina tunes, or the constant annoyance that is Navi the fairy (hey hey, listen) are also portrayed correctly. Ocarina of Time 3D is exactly as I remembered it in the music department. I love it. The Legend of Zelda Ocarina of Time 3D is a great game for a handheld system. You get two games for the price of one, full 3D, and a Zelda game that is consider one of the greatest in the series. Everything is as you remember it, every secret, every heart piece, and every strategy. I loved this game as a kid and I love it now as an adult. This is currently the best game in the Nintendo 3DS lineup. If you haven’t played Ocarina of Time before, now’s the time to get it. If you loved it back in the day you’ll love it even more now.